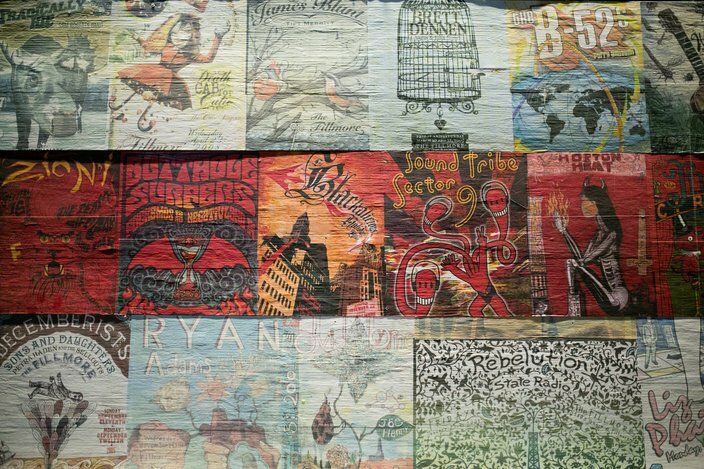 This Betsy Ross-style American flag made of concert posters decorates the Fillmore's large bar area. Live Nation's House of Blues Entertainment announced in April that the former Ajax Metal Company factory at Frankford and Delaware avenues would become The Fillmore Philly this fall. Hall & Oates are scheduled to christen the mega-venue Thursday, Oct. 1, so there's just over a month left before the massive structure must be fully completed. 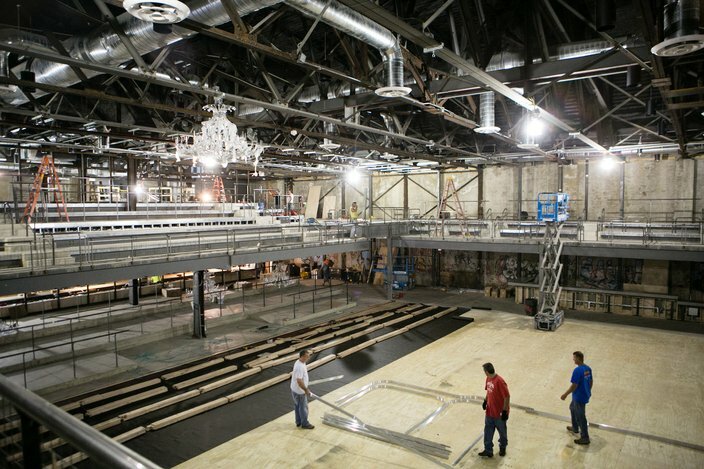 David Fortin of House of Blues Entertainment and Live Nation's Kevin Finch gave PhillyVoice a tour of the site Wednesday, Aug. 26, to see how the work is coming along. The site is very much a construction zone at the moment, which is to be expected considering the overhaul taking place. What will be the Fillmore's main entrance rests along Canal Street. The lobby there will host a box office for not only the Fillmore but for Philly's other Live Nation venues, Theatre of Living Arts and Tower Theater. From there, visitors enter into what's being referred to as Ajax Hall, a large hangout space with a bar and merchandise center. 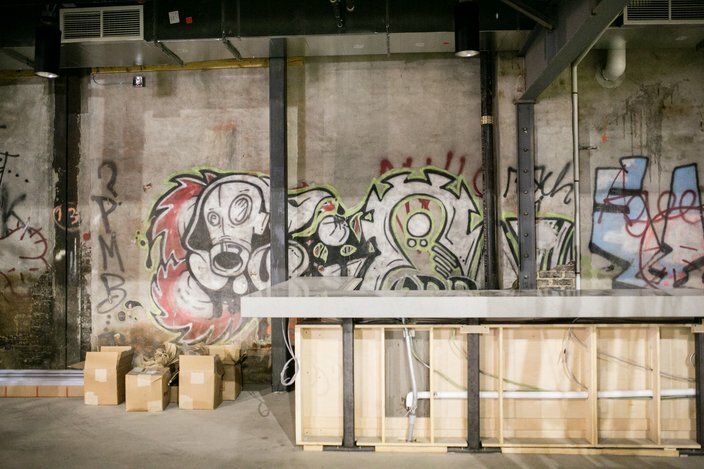 The big, wraparound bar will have food and drink service, so guests could maybe grab bites there before a show or snacks afterward. 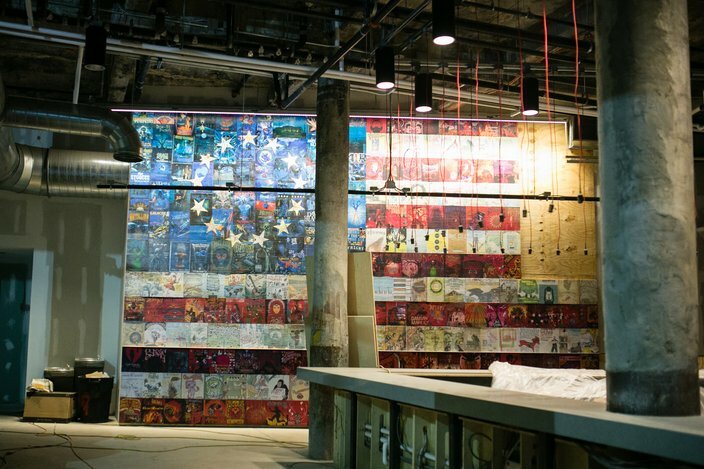 A Betsy Ross-style American flag, created using color-enhanced Fillmore concert posters, covers an entire wall, providing the bar's backdrop and plenty of Instagram opportunities. Keeping with the theme of preserving tradition, a giant Ajax logo sign will be prominently featured on the east wall. 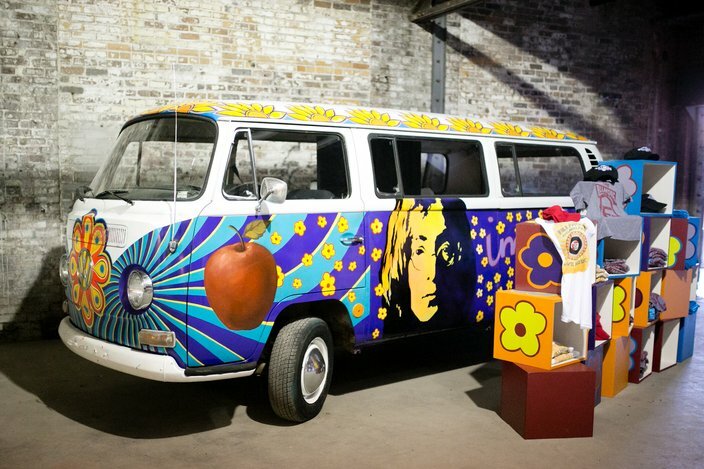 The merchandise (tanks, tees and more emblazoned with Fillmore logos, including one featuring the Liberty Bell) will be housed in an authentic museum-quality 1968 Volkswagen bus. It's been outfitted with a psychedelic paint job featuring the faces of John Lennon and Jimi Hendrix, to boot. In the back of the general admission section, a set of risers has been placed on top of a platform, meaning those who arrive a bit late to a show won't have to miss the entire concert. Up top, the mezzanine is lined with VIP boxes (really just gated off sections with seats, so they don't obstruct other guests' vision) with incredible views to the stage. Just behind them, on either side, will be a general admission balcony. 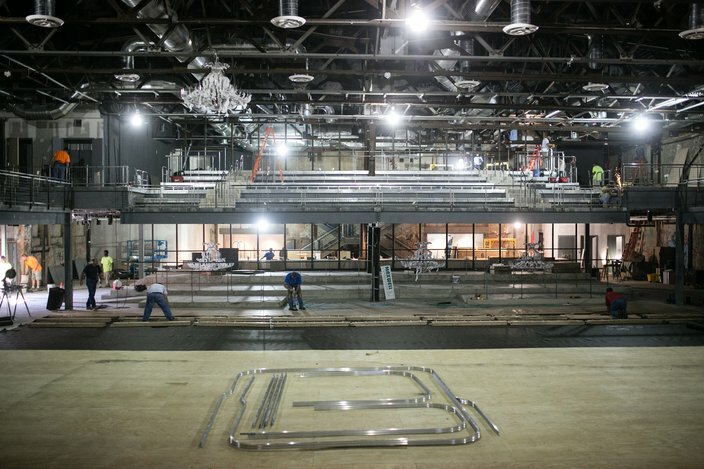 In the center of the mezzanine, looking straight out onto the stage, 50 seats will be put down as well. 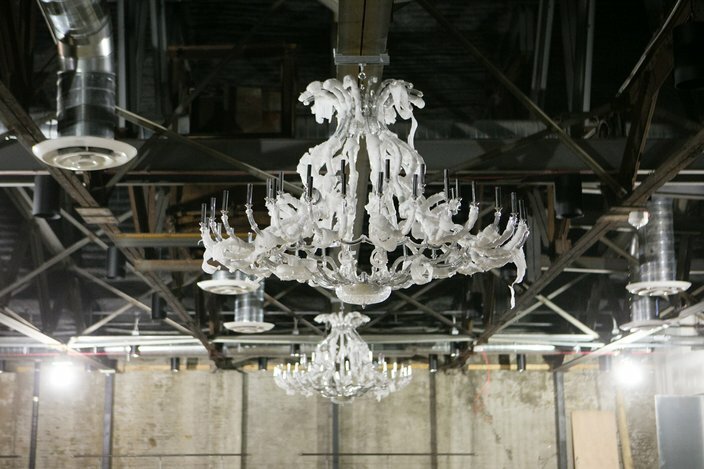 Upstairs, behind the mezzanine and auditorium bar, lies a dual-purpose venue. Though previous reports made it seem like the space would house The Circle Bar, a fancier bar with a full food menu, and The Foundry, a smaller live music club, separately, it appears they are now kind of one in the same. When live music isn't scheduled for the night, The Circle Bar will still be open, but when acts are booked for the more intimate stage, they'll be playing The Foundry. 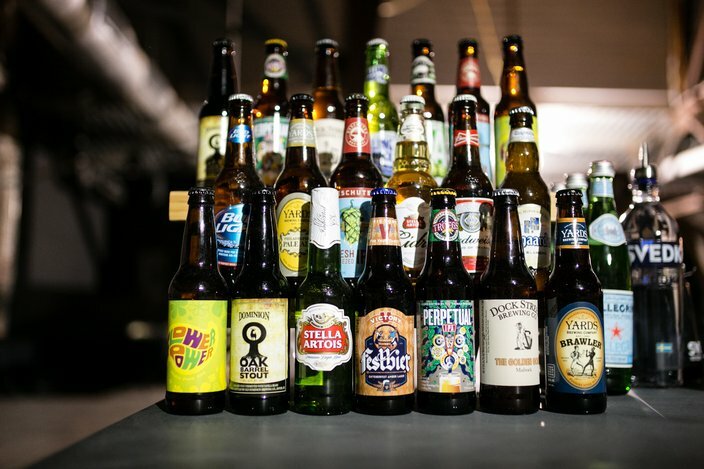 As reported when the Fillmore was announced, a range of craft beers, wine, liquor and locally favored brands will be served in the venue's multiple bars. And when we say multiple, we mean it. There are at least six natural stone-topped bars scattered around the venue -- one in Ajax Hall, three on the ground floor of the main auditorium, one on the mezzanine and one in The Circle Bar. Live Nation teamed up with Wolfgang Puck for food throughout the venue, so it won't be your standard "cold pizza, warm beer" concert fare, said Finch. The menu at Circle Bar, which Finch called "intellectually interesting," features finger foods, shareable appetizers, burgers and plated meals ranging from $6 to $15. Fortin and Finch made clear throughout this sneak peek that Live Nation's main goal with the space is to nix the pet peeves of concertgoers from the get-go. They've paid special attention to the sight lines, put in enough bars to quench the crowd's thirst and, to top it all off, made some 26-stall bathrooms to ward off long lines. As for the neighborhood that will have to deal with it all? Finch couldn't tell us much but said Live Nation will be reaching out to the surrounding residents. "We're working really hard to be good neighbors."